I had originally started this post on Sunday night but the power in our house went out before I could finish. Then the snow/ice storm hit Atlanta and well here I am now. I referred to my special present I received in my last post and since then I received a second one. My first blog award! I am so excited! The ladies over at these oh so generous and lovely blog's The Hickman Four and Undeserving Grace gave me a sweet surprise. I must say many many thank you's to them both. I am very grateful that you thought of me.I didn't know much about blogging before I started but I am so thankful I did. It's a whole different world and escape for me. I have been inspired by so many. 3. Pay it forward to 10 recently discovered great bloggers. #4. I am very forgetful when it comes to personal tasks that need to be done. You can tell me something and a minute later I forget. I write lots of notes or should write lots of notes at home. #5. I love Christ and know how much he loves me. I just wish to become more like Christ and disciplining myself to be a better example of Him and what he has done for me. #6. I still have the same friends since high school, haven't travelled very far. I love them dearly and wish we had more time to spend together. #7. I wish I would have gotten the chance to travel before I had kids because saying "one day" or "some day" doesn't always mean you will be here to see that "one day." The only guarantee we have is what we have already done. 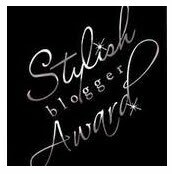 So, I will now pass my Stylish Blog Award to some very special blogs, not only because you have a stylish blog but because the person behind the blog is undeniably stylish too! From the bottom of my heart - Thank you Heather! You brightened my day even though it's night :) I love your number 6 because I too have the same friends since High School. The friends you know will just ALWAYS Be there even if alot of time has gone bye. You just made my day Heather. Thank you so SO much. I'm truly honoured that you thought of me. Thank you so much for the award! I love reading your blog as well! It's so nice to be thought of! thanks for the award! Like the others, I too have a touch of the old A, but with God's grace, she's slowly passing away!